While I generally love Scott Westerfeld’s novels, this one fell just a bit flat for me. The novel itself is extremely long, and after the first 200 pages, I found that both storylines began to drag a bit, which is unfortunate since the novel started out with much intrigue. Unfortunately, I ended up not caring much for either protagonists, and I think a lot of my enjoyment of the story diminished as I got to know them more and more. Darcy is somewhat of a boring person. Unsure of herself within the world of authors, she stumbles along and overspends on her writing advance time and time again, wrapped in the throes of what, to me, seemed like an instant lesbian relationship meant to shock readers more than drive the plot. The relationship seems to fabricate out of thin air, and while Darcy definitely learns the ropes of authorhood from girlfriend Imogen, this portion of the story felt forced to me. 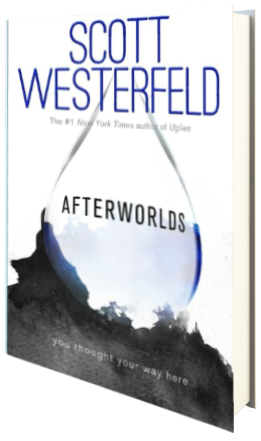 And while I do enjoy novels that portray the world of authors, Afterworlds is the third novel I’ve read over the past month that deals with this topic, and by this time, it sort of felt old hat. Having read and loved both The Write Stuff by Tiffany King and Neurotica by Eliza Gordon prior to Afterworlds, I found that Darcy’s story just didn’t bring anything new to the table for me, aside from a protagonist who’s story was juxtaposed with her novel–awesome in theory, less so in execution. As Afterworlds tells two different stories, one of the real world in which Darcy resides, and one of the paranormal world in which Lizzie, the protagonist of Darcy’s debut novel, resides, I actually found myself more drawn to Lizzie’s story. Westerfeld alternates between the two, and I found myself, in the beginning, really wanting more and more of Lizzie’s story, but again, as the novel progressed, I found myself liking Lizzie less and less, and as it turns out, we don’t get the full story of Lizzie and her newfound powers—instead, it’s more of a shell. And I soon found myself losing interest in Lizzie and her world as well. Honestly, I feel as if the novel could be divided up into two shorter novels as the worlds don’t really intersect in the book, aside from the fact that Darcy is the author of Lizzie’s story, and that the publisher wants massive rewrites to the story. I really would love a fully developed novel surrounding Lizzie and her world, but I doubt we’re actually going to get it. Two stars. I loved this book so much. Read it in a day or two which is something that doesn’t happen very often, especially with such long books. I agree with you about Darcy. Her confidence was low even though her book’s getting published.